The second day of the trial has begun. The judge nodded and opened his mouth. Prosecutor Gavin had a confident expression as he snapped his fingers. The courtroom doors opened and the witness entered. The judge took one look at the witness and blinked in surprise. The judge was momentarily dumbfounded, but quickly regained his composure as he continued. 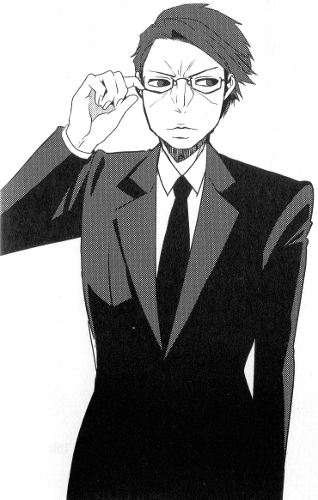 Edgeworth carried an air of authority greater than the judge as he introduced himself, leading into his testimony. Edgeworth's expression was even harsher than usual. The judge's face was red with rage. He may be a fairly easy going judge, but it seems he has a deep hatred of corruption. There's should be no real connection between Mr. Goodwin's fraud and his murder. Yet Edgeworth was still called as a 'witness' for the murder case. The gallery went into an uproar. Newspaper reporters left the courtroom to pass on this latest information. The judge slammed his gavel. I nodded. It may be that Mr. Goodwin was in actuality a horrible person, but I wasn't willing to accept it as a motive. Prosecutor Gavin opened his mouth. 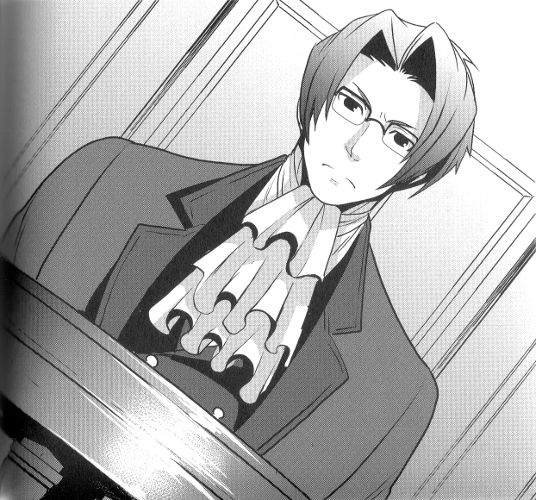 Having fulfilled his role, Edgeworth turned on his heel and left the witness stand. Prosecutor Gavin gave him a light bow before he continued. Prosecutor Gavin had a triumphant smile. Ramon took the witness stand with a disgruntled expression. Quickly introducing himself, Ramon forcefully began his testimony. Ramon shook his head fiercely. Mr. Goodwin was dead and gone, his fraudulent activities uncovered, yet his influence on the people of Seafield city wouldn't fade that easily. Ramon seemed to fear something. It was at this point that Athena, who had been standing silently next to me until now, whispered to me. Athena's hearing really is impressive. When there's a contradiction between someone's words and their feelings, she hears distorted 'noise' in their voice. Nothing gets past her hearing. Indeed. The prosecution's goal is clear. Ramon and Apollo are close. If Ramon's grudge against Mr. Goodwin became clear, it would be disadvantageous to Apollo. But even so, we can't avert our eyes from the truth. Only when the whole truth has been revealed can the right verdict be delivered. The verdict that Apollo is not guilty. Holding on to this belief, I nodded to Athena. Prosecutor Gavin continued his questioning. Unable to hide it any longer, Ramon hung his head. So many of Seafield city's residents owed Mr. Goodwin their gratitude. It's only natural they'd turn against those who opposed him. I'm not sure I can even imagine the harassment levelled at 'The Flying Spaghetti Master'. It's Athena's time to shine. I kept quiet and let her do the talking. Ramon's expression was as if he had been slapped. His clenched fists trembled. Athena looked Ramon directly in the eye. Nobody can hide their true feelings from Athena. Ramon averted his eyes for a moment, before lifting his head and speaking in a weak voice. Tears streamed down Ramon's face. ... Hm? Hold it. Something doesn't add up here. I quickly identified what struck me as off and enquired about it. Ramon tilted his head as he looked at me. He didn't seem to be playing dumb. He seriously had no idea what I was talking about. Ramon stared blankly. Prosecutor Gavin spoke with an exasperated shrug. No, but... Both Athena and I heard about it. Ramon doesn't seem to be lying... what's going on with this contradiction? Ramon stared blankly for a moment, before bursting out in laughter, slamming the witness stand. ... Eh. A paper plane...? The gallery tried to stifle their laughter. I never suspected that 'grandpa's plane' was a paper plane... I'd jumped to the wrong conclusion and embarrassed myself. Prosecutor Gavin gave a sarcastic laugh as he returned to the previous topic. Prosecutor Gavin turned back to the judge. And in a finishing gesture, Prosecutor Gavin pointed directly at the defendant's chair. The judge shook his head. I had no comeback. ... The judge was right. Evidence is everything in court. I can't use Apollo's temperament as an argument. But I can't back down. Prosecutor Gavin gave a friendly smile. No, if there's no existing holes, then I'll just have to poke some myself, that's my role as an attorney. I'll drag some useful testimony out of him one way or another. Standing at the witness stand, Dr. Mendel looked like an older gentleman with streaks of grey hair. He was plump and had a moustache below his nose. Prosecutor Gavin turned back to me. I shook my head. The two of them are acquaintances. They could've spoken to get their story straight. Anyway, time for my cross examination. Dr. Mendel hung his head. Dr. Mendel's gaze was briefly uneasy. ... Huh? I wonder what that was. It was a question I'd asked with little thought, but something about it had shaken Dr. Mendel. Is there some kind of contradiction hidden here? Dr. Mendel lost his cool and began looking around nervously. Sweat poured down Dr. Mendel's brow. I shouted at the top of my voice. I felt like a weight had come off my shoulders. Dr. Mendel leapt up flailing his arms about, before returning to his former calm gentlemanly demeanour. Dr. Mendel leapt up flailing his arms about again... He's so transparent. With all eyes on him, Dr. Mendel confessed with embarrassment. Having become a shadow of his former self, Dr. Mendel twiddled his fingers timidly. Prosecutor Gavin looked at the gallery. His fangirls in the audience squeed. Some of them even waved hand fans about. This isn't a concert hall. Prosecutor Gavin gave a flashy signal to the bleachers... I mean, gallery. And in response, none other than Mr. Secker stood up. He silently came down to the stage... I mean, witness stand. His expression was a little stiff, yet calm. When he reached the witness stand, Mr. Secker gave a deep bow. The judge scolded him sternly. Mr. Secker lowered his head again. Mr. Secker pushed his glasses up with his finger. The judge was quickly swayed by this story. I won't be swayed so easy though. I spoke harshly as I glared at him. I nodded as I pressed for more answers. Mr. Secker scoffed. Prosecutor Gavin spoke again. ... I'm not sure how much weight there is to swearing on a guitar. I looked to the judge. Eh... Eeeeeeeh... The judge is way too easily swayed. The judge responded with a question. Mr. Secker's voice trembled as he spoke. The gallery once again became unsettled. People were whispering to each other. Crap. The atmosphere in the courtroom seems to be heading for a swift verdict. At this rate a guilty verdict will be handed down. Mr. Secker lifted his head and spoke clearly. He's speaking as if the trial is already over and he's planning his next step. I won't let it end like this though. Somewhere... There has to be a contradiction somewhere. The judge picked up his gavel. The scene of the courtroom fell silent. The judge was about to hand down his verdict. It hit me. I finally realised. The unnatural element. As the judge began bringing down his gavel, I shouted at full force.